Home > Old World Christmas - Traditional Glass Christmas Ornaments > Old World Christmas Glass Ornament - "The Bride's Tree Collection" - FREE Shipping Item! Use code BRIDEFREESHIP at checkout! FREE GROUND SHIPPING* within the Continental US on Old World Bride's Tree or Wedding Collection. Enter coupon code "bridefreeship" during checkout! 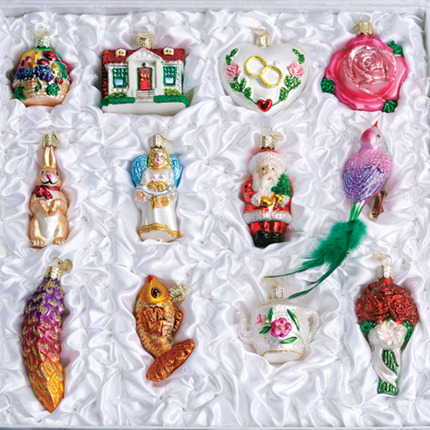 Each glass ornament produced for the Merck Family's Old World Christmas Glass Ornament wedding collection is hand crafted in age-old traditions. 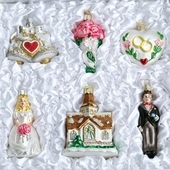 Boxed Set of 12 Ornaments vary in size from 2 1/4 inches to 5 1/4 inches.